Olivia Newton-John is a woman who radiates health, positivity and wellbeing. She is often asked, 'how do you do it?' In Livwise, Olivia explains her belief in the importance of eating a healthy diet in order to maintain wellness and balance. This book will introduce you to ways of eating and living that will keep you in good health and happiness. These simple, wholesome, tasty recipes are the ones Olivia loves to cook for her family - some created in her own kitchen and others contributed by friends and chefs at her Australian health retreat, Gaia. From delicious salads and snacks to hearty mains and guilt-free desserts, the recipes in Livwise offer a perfect balance of flavour, goodness and vitality. As a breast cancer survivor (or cancer thriver as she prefers), Olivia is raising funds for The Olivia Newton-John Cancer and Wellness Centre in Melbourne. Her royalties from the sale of this book will go to the centre. 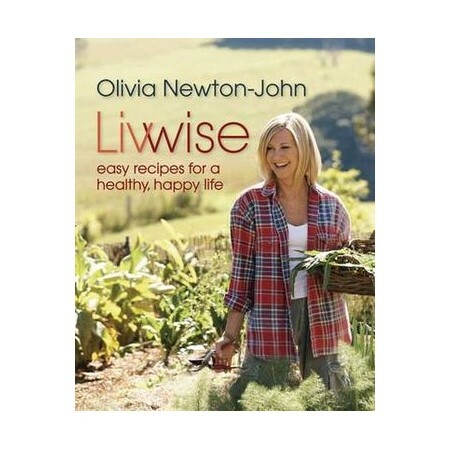 The recipes in Livwise are practical, easy to follow and based around fresh ingredients and all designed to make you feel good; recipes include: breakfast; shakes, smoothies and juices; starters, snacks and breads; salads and dressings; mains; and sweets; Olivia's vibrant personality, tips and thoughts are included throughout the book. Olivia Newton-John AO, OBE is an English-born, Australian-raised singer and actress. She is a four-time Grammy Award winner who has amassed five No. 1 and ten other Top Ten Billboard Hot 100 singles and two No. 1 Billboard 200 solo albums. Her music has been successful in multiple formats including pop, country and adult contemporary. She co-starred with John Travolta in the film adaptation of the Broadway musical, 'Grease', which became one of the most successful films and movie soundtracks in Hollywood history. Olivia has been a long-time activist for environmental and animal rights issues. Since surviving breast cancer in 1992 she has been an advocate for health awareness, becoming involved with various charities, health products and fundraising efforts. Her business interests have included launching several product lines for Koala Blue and co-owning the Gaia Retreat & Spa in Australia. Olivia currently lives with her husband in Florida.